The Char Broil Classic 300 Gas Grill is another budget friendly LP gas grill that made my list of best low cost propane gas grills of 2017. This model is a decent choice for any who are not in need of all the extra bells and whistles. While these low costs grills may not be built to last for many years, the Char Broil Classic 300 doesn’t look as cheap as most gas grills under $200. Char Broil has been innovating outdoor cooking for over 65 years and is America’s top selling gas grill brand. For several years now, Char Broil has been successfully producing a line of “small footprint” gas grills. 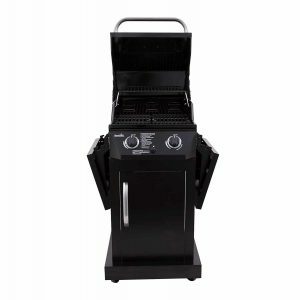 This model is one of the simplest and least expensive of their “small footprint” style of grills. With a compact design that will fit into even the smallest spaces, it is perfect for the city griller. With its small size, inability to hold high heat and limited options, there is not a whole lot to get excited about. But for a grill that is under $200 USD, there shouldn’t be. However, for the griller on a tight budget looking for the basics, this grill combines value and a compact design that does its job. So, for the price this isn’t a bad grill, just don’t have expectations of it lasting all that long. This Char Broil Classic 300 Gas Grill Review will help you decide if this is the LP gas grill you need for 2017. 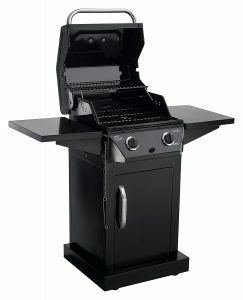 This Char Broil 2 burner, 30,000 BTU gas grill features 420sq inches of total cooking surface. The Char Broil Classic is a good size for a small family. With 300sq inches of main cooking area, it does not take up too much space. People with smaller patio’s or limited space will appreciate its compact design. It also features 120sq inches of secondary cooking area (warming rack), which makes it roomy enough to cook for a small family gathering. Featuring wide side shelves for extra work space that fold down for easy storage or when you just want them out of the way. In addition, an enclosed cabinet lets you store all your cookout essentials. For an easy and reliable cookout experience, there is an electronic ignition system making start up a snap. The 2 stainless steel burners provide 30,000 BTUs of heat and the porcelain cast iron cooking grates retain that heat and make for easy cleanup. They are also rust resistant. The warming rack lets you shuffle the deck while you are cooking to keep food warm. The four wheels (the back two wheels can be locked in place) make it easy to move around. To hide the tank and provide storage for grilling essentials, it comes equipped with a large easy access painted door in front. This entry from Char Broil is not a fantastic grill, but for under $200 USD it’s not a bad choice either. Its 4 main features that catch the eye are an enclosed door cabinet, 2 fold down side tables, a small footprint and better looks but unfortunately, there is little else. The grill is made with thin, painted steel and won’t last you more than a few seasons. There is a reason grills in this price range are considered “disposable” grills. You can certainly squeeze a few more years out of this grill with attention to maintenance and a little TLC. Keeping it clean and properly covered always go a long way in prolonging the life of any grill. The cooking setup is simple and basic with two low-grade stainless steel and thin burners below 2 porcelain coated cast iron cooking grates. And while the heat output is respectable for a grill of this size, the thin construction make it a struggle to hold in heat. Also, the igniter will most likely fail within a year or two. This should not be completely unexpected as grills in this price range typically are notorious for this. 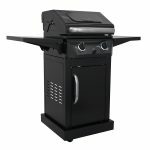 The Char Broil Classic 300 Gas Grill has received many positive comments from its owners at Amazon.com. It is currently rated 4.3 out of 5 stars. In all fairness, its owners have also voiced a number of negative reviews. 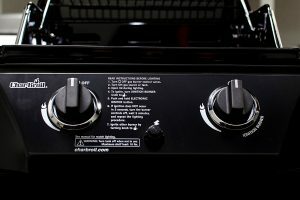 Like most gas grills in the price range, the char broil classic 2 burner gas grill is far from flawless. With that being said, it seems that a high majority of its owners are satisfied with their purchase. The simple design is easy to use and quick to clean. The small size is a great space saver and easy to store. Finding an inexpensive grill that cooks well and will last for a few seasons is not easy. It is important to remember this when looking at grills in this low cost price range. If you are in the market for something that will last you for many years, then this grill is probably not the right one for you. But if all you need is an inexpensive propane gas grill that does its job and is a good size for 2-6 persons, then this Char-Broil Classic 300 is worth looking into. Overall, this is a fairly decent combination of value, feature, and size. If you would like to leave a comment or have a review of your own to share on the Char Broil Classic 300 Gas Grill, please do so below. We always welcome your input. *This rating is based on comparable gas grills in the low cost price range. This rating is not meant to be compared to mid range or higher gas grills.